Valencia College’s campus security officers are sporting a new look this fall. Not only are they wearing new uniforms (made of moisture-wicking fabric), but you may soon see them biking across campus. Although the college’s security officers currently patrol on foot and in golf carts, under the direction of Paul Rooney, the college’s assistant vice president for safety and security, the college is now creating a bike patrol, which will enable officers to patrol campuses quickly and maneuver through foot traffic more effectively. Over the summer, Valencia purchased mountain bikes that are used by many agencies as police bikes. The bikes are currently being outfitted with additional gear (police lights, etc.) and security officers have been undergoing bike-patrol training. 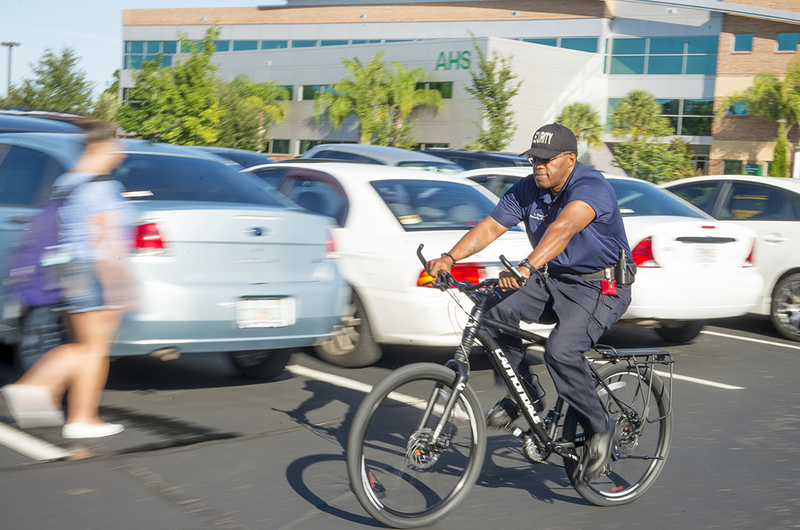 Soon, you’ll see officers riding bikes around campus on East, West and Osceola campuses – and in the future, expect to see bike officers at Lake Nona and Winter Park campuses too. Other changes you’re likely to see around campus this year: K-9 officers from Orlando, Winter Park and Kissimmee police departments and the Orange County Sheriff’s Office may occasionally appear on campus, as part of routine patrols. In addition, the college is researching funding opportunities to install more security cameras on campuses. And the college is planning to offer a women’s self-defense course for faculty and staff.